The Bunny Bungalow: Can Spring Be Far Behind? 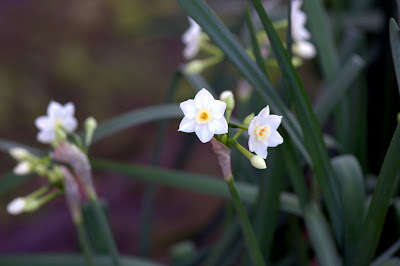 The Paperwhites have just begun to bloom under the old pecan tree at The Bunny Bungalow. Last week they were only tight little buds. The opened flowers seem to smell sweet (last year they were rather stinky and Tall Husband complained.) By next weekend there will be enough blooms to cut and bring into the bungalow for arranging in all my old olive oil and milk bottles. I know: the photos are a little blurry, but the wind thought it was March instead of January. 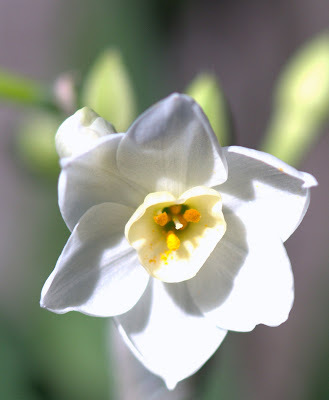 This caused the Paperwhites to dance wildly around as they were being photographed; too wildly for the VR (vibration resistance) setting to help. Later perhaps they will stay still when the wind dies down. Mine are starting to bloom also. My bouganvilla is bright with blooms. Roses tried, but the little "nip" we had last week got them. The weather in Houston is very confusing to all those lovely plants. I wonder if the azaleas will be on time this year. It's nice that you already have a little bit of spring emerging. We are going to California next week and hope to expereince what you are through the flowers and the birds singing to the warmth of the sun. Thanks for stopping by. Have fun in California. By-the-way, that white bunny on your blog is so beautiful. He is how I found you. I saw him on someone else's blog list.